Food Costs > How Much Does a Cake Boss Cake Cost? How Much Does a Cake Boss Cake Cost? Buddy Valastro, the fourth-generation baker who is well known for creating amazing cakes, has earned the TLC television show, “Cake Boss.” He is the successor of his father and his extended family in the cake business. 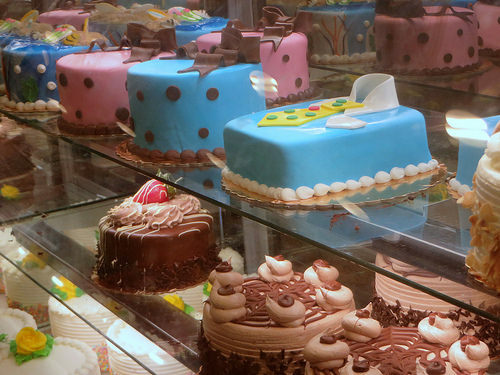 The cost of purchasing a cake from the “Cake Boss” bakery, known as Carlo’s Bake Shop, will depend on the type of cake you want, if it’s going to be customized, the size, the complexity and the decorations. On average, cakes can average anywhere from as little as $3.50 for a cupcake to more than $50+ for a fondant cake. Keep in mind that this is going to be from the official bakery and more than likely won’t be made from Buddy Valastro himself. As for customizations, this MarketWatch.com article, when interviewing Buddy, said custom cakes can start at as little as $300 or even as little as $100 if you were to choose a decorated sheet cake. Also, don’t be surprised if your quote is as high as $5,000 if you were to want a cake that had some mechanical elements. According to some who did receive a quote, many were quoted anywhere from $12 to $18 per person. For a consultation, the bakery does charge $100 for a tasting and one-on-one design, but in some cases, this fee can be waived if a coupon is currently available. Refer to the chart below on the average costs of premade items located at the bakery. These items can be purchased directly at the bakery located in New Jersey. On this Disboards.com forum thread, for instance, one member was quoted $640 for a two-tiered cake that was circus themed. Another member on this same thread said they knew someone who paid $1,500 for a small wedding cake. On this Reddit.com AMA (Ask Me Anything), a former employee answered questions from the public and said the giant cakes you often see on the television show can cost a couple thousand dollars. The bakery can deliver cakes locally for more than 50 people for an additional fee. As for shipping, the bakery will not ship cakes, according to their FAQ page. The Cake Boss lobster tail pastry is the most popular pastry sold, according to TLC. This pastry received its name due to its shape like the crustacean’s hindquarters. Cake Boss products can be purchased directly from their website at CarlosBakery.com. At this time, only baked goods can be shipped. In 2011, Buddy Valastro created a $30 million cake for socialite Devorah Rose. The cake, while it didn’t have expensive ingredients, per se, was actually decorated with premium diamonds, emeralds and sapphires. Other popular cakes include the Dr. Suess cake and Transformer cake. Be forewarned that many have claimed they had to wait up to a year to have the bakery make a cake. Even though the original location is no longer at its original address, the bakery has locations at the Mall of America; in the Willowbrook Mall in New Jersey; in the Venetian Palazzo in Las Vegas; Morristown, New Jersey; Orlando, Florida; Ridgewood, New Jersey; Westfield, New Jersey; Red Bank, New Jersey; The Woodlands, Texas; and at the Discovery Times Square Exposition in Times Square, New York.